All Vodkas are NOT created equal. Jean-Marc Daucourt is a genius as creating premium spirits and brands. Seriously — his track record is impressive. His father’s family had been in the Cognac business in France for years, but Jean-Marc wanted a more diverse education on the subject, so when he came of age, he went to Scotland and Germany to work his apprenticeship in Europe’s finest distilleries. Returning to France as a master distiller, he acquired an old distilling house in southwestern France and set himself to work creating a wide range of fine spirits, including Bastille 1789 Whiskies, X-Rated Fusion Liquor, and XO Vodka among others. 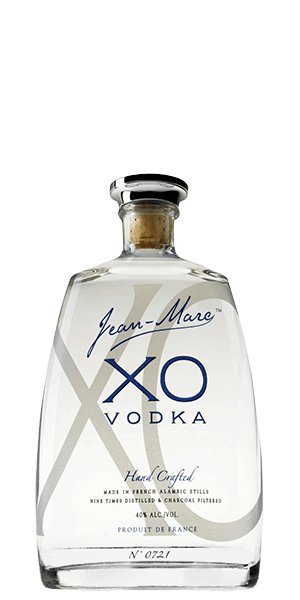 What does Jean Marc XO Vodka taste like? The Flavor Spiral™ shows the most common flavors that you'll taste in Jean Marc XO Vodka and gives you a chance to have a taste of it before actually tasting it. Light and floral with a hint of ripe fruit and coconut. Gentle, lightly sweet, with crushed grain and spice. Long and smooth with a lingering freshness. Great for martinis, but be careful as it is so smooth you will not feel it until you stand up. My favorite vodka, hands down. Smooth, fresh, and clean describes this vodka just right. Bought it for martinis and vodka tonic with lime. Never made a martini.It made such a refreshing vodka tonic. It was also a great sipper. If you're on the fence, jump off. It won't disappoint. Very smooth, dangerously smooth. So smooth I'll keep it for sipping. You were right Thomas. It goes down a lil too easy, lol. I thought I would use it for my dirty martinis. Very little burn, nice warmth in the throat and chest, long finish. I am learning spirits and using the eyes, nose, and palate knowledge from my fine wine enthusiasm. Great start to the world of vodka. I'm impressed! My fave for Martinis!!! No vermouth needed for this smooth as smooth gets vodka. Not going to lie to you these go down a little too easy. Trouble ahead!! You are so right, Thomas, trouble ahead, lol! Best I have ever had, by far. Very smooth with a clean finish. Very impressed. I drink Belvedere, but I felt that this was a superb and unique vodka that will be hard to beat. My wife did not care for it as much as I did, but I could drink this stuff instead of water! The best Vodka I've ever had. Having served in the Navy that's saying a lot lol. I love the faint vanilla taste, it's not overwhelming, nor is it nonexistent, it's just right. Then unlike most vodkas it has the vanilla taste as an aftertaste. The heat going down is still there but with the vanilla taste and aftertaste you hardly notice it. Is it worth the price? That's up to you to decide, if looking for something to party with I'd go cheap, for a good sipping vodka to truly enjoy then to me it's worth it.